The extraordinary world introduced in Paul Pope's Battling Boy is rife with monsters and short on heroes... but in this action-driven extension of the Battling Boy universe, we see it through a new pair of eyes: Aurora West, daughter of Arcopolis's last great hero, Haggard West. A prequel to Battling Boy, The Rise of Aurora West follows the young hero as she seeks to uncover the mystery of her mother's death, and to find her place in a world overrun with supernatural monsters and all-too-human corruption. 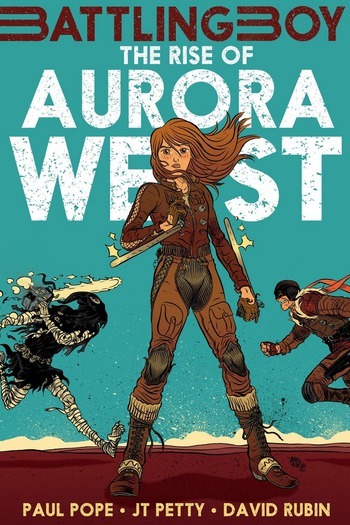 With a taut, fast-paced script from Paul Pope and JT Petty and gorgeous, kinetic art from David Rubin, The Rise of Aurora West (the first of two volumes) is a tour de force in comics storytelling. Paul Pope is the acclaimed author-illustrator of Batman: Year 100, Heavy Liquid, and 100%. He has won three Eisner Awards, and his first graphic novel for kids, Battling Boy, was a #1 New York Timesbest seller. JT Petty is an American film director, author, and video game writer. With Paul Pope, he wrote two Battling Boy prequels: The Rise of Aurora WestandFall of the House of West. David Rubin is a Spanish cartoonist and author of critically-acclaimed graphic novels including The Hero and Beowulf. He directed the animated feature film Spirit of the Forest and has been the subject of a documentary.